Uncanny Day is Cory Clubb’s first foray into Young Adult fiction, and it is an impressive, imaginative debut. Cory has done what is virtually impossible to find in fiction these days, originality. Genre fans, as well as fans of YA fiction and storytelling, will no doubt find themselves turning pages rapidly, in the hopes of seeing what happens to the protagonist, Nolan Day. As the book cover ominously reveals, “Be careful what you think”, and this is a strong message to the reader as well; you will find yourself wondering what the author has in mind for these characters, and, happily, it is far from what you might expect. I won’t give away too much of the plot here; suffice to say, Nolan Day is a high school student with a unique ability that we all wish we had in high school: Nolan can read minds. We have seen this ability manifest in several films, comics, etc., but never in this particular fashion. Every time Nolan jumps into another person’s mind, we are treated to this beautiful canvas of unique symbols, images, and concepts that are inimitable to the particular character in question, and it is fascinating. The motivations of the characters Nolan Day finds in his one on one interactions with them materializes in unique, imaginative ways, as Day explores the inner psyche of each individual. The reason he does this fits in perfectly with Nolan’s internal conflict, and propels the story forward, rather than as a point of amusement. This was perhaps my favorite part, as each person’s mind contains secrets that are unique to the individual, and Day has to discern them as he explores each mind he reads. There is a price, as Day gets more and more serious nosebleeds and other side effects that have ramifications on his physical and emotional health. It is a side effect of having powers that is rarely explored, and Clubb does it with panache and a unique sensibility that I found refreshing. He also has a lot of fun presenting Day’s teen angst, but it comes across as much more mature than some of the other angst we have read about. This truly is a unique take on a genre that desperately needs a sprinkling of originality. Just as surprising is the presence of a gothic element that (without giving too much away) starts to “haunt” Nolan Day that is truly frightening. There were specific moments here that caught me off guard, and borderline on genre-bending. We also see some intriguing elements of Day’s past that are spine-tingling, and this is explored with dramatic effect. His relationship with his foster parents is touched upon, but it his relationship with his foster brother that is the real draw, as is his relationship with his friend/rival Kate that will leave you curious as to the next chapter in this new and exciting series. While there is no doubt that I am biased (as anyone reading this on Coffee with Kenobi will no doubt be aware of), I also call it like I see it. 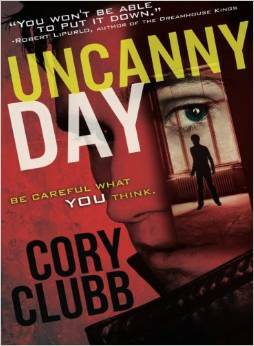 Cory’s novel, Uncanny Day is an exciting, suspenseful, genre-busting YA novel that will have you wanting to learn more and more about Nolan Day’s world. The book ends in such a way that you will feel satisfied with what you have experienced, but definitely eager to see what Clubb has in mind for the sequel. Thanks to Cory for providing me with a review copy!